Ze best looking beast in Hearthstone yet. The golden one looking nice. So satisfying getting lethal with my golden Krush. None of my opponents expect it when I play him. My son loves seeing this card played. Dinosaur Rawwwrrrr! He was the first legendary I ever opened. I remember using to great effect in vanilla and naxx since nobody expected him or played around him. However, nowadays he's just too slow. I still can't believe I got him from Welcome Bundle... That's a big dissapointment. Blizurd will never change it and this card will probably never become viable. I crafted this guy. (yes I actually did) . Thus far I enjoy using him. Especially with the new gadgetzan buff cards. 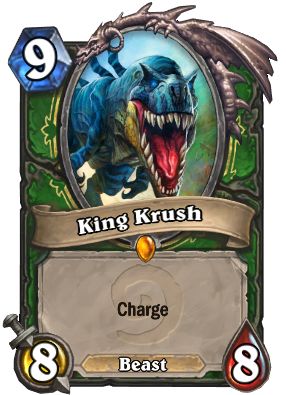 Throwing out a 14/14 King Krush at round 9 is pure bliss.